The University of Mannheim has been elected the most beautiful campus of Germany, which is mainly located in the Mannheim Palace. With a length of 400 meters, it is one of Europe's largest baroque castles, second only to Versailles. In recent years, it has been renovated extensively thanks to private donations totaling around 13 million Euros. Modern steel and glass elements now offer a fascinating contrast to the almost 300 year-old walls. About 3,000 employees and 12,000 students currently enjoy the privileges of this unique setting and atmosphere. The palace is surrounded by the "Mannheimer Quadrate", or Mannheim squares, which define the layout of the city center. The palace’s architecture echoes this regular, right-angled pattern. The Baroque-style building comprises five wings, with the severity of the long three-story façades broken up by four-story pavilions. In 1720, Prince Elector Carl Philipp transferred the palatinate’s seat of power from Heidelberg to Mannheim and initiated the construction of a new palace. The residence was completed under the reign of his successor, Carl Theodor. A connoisseur of the arts, Carl Theodor was a generous patron of music, theatre and science. He surrounded himself with leading artists and musicians, making Mannheim a Musenhof, a place known for its circle of luminaries. Among the illustrious visitors in the 18th-century was Wolfgang Amadeus Mozart. 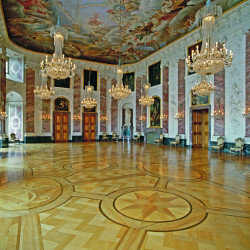 Mannheim Baroque Palace’s original interiors were one of the wonders of European architecture - especially the main floor. However, the building was severely damaged during the Second World War. Since then, the main part of the palace has been rebuilt, including the majestic ceremonial staircase and stately knights’ hall. 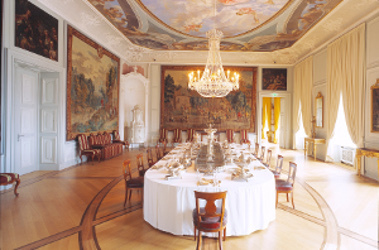 Today, the restored grand rooms of the bel-étage (main floor) are furnished with over 800 exhibits, including 21 large tapestries, ornate furniture, priceless paintings, valuable porcelain and costly silverware - recreating its bygone grandeur. 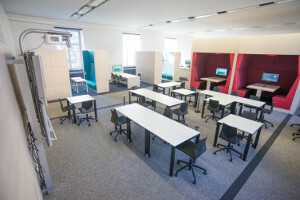 As part of the "Renaissance of the Baroque Palace" fundraising initiative, lecture halls and the library in the Baroque Palace were renovated and equipped with the latest technology. The "Renaissance" fundraising initiative was initiated by students, faculty and alumni. Numerous companies, foundations and private donors contributed.